The RadPieChart visualizes its data points using radial coordinate system. Each data point is represented as a slice from a pie. The ratio between the space consumed by each slice and the space consumed by the whole chart is the same as the ratio between the value of the data point that it represents and the total value of all data points in the series. Series: Gets a collection of all series presented by the chart instance. Behaviors: Gets a collection of all enabled behaviors. 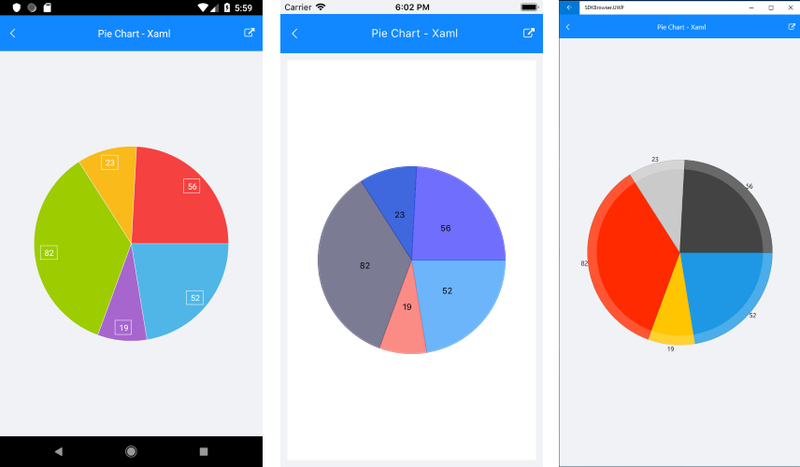 Palette: Gets or sets the ChartPalette instance that defines the appearance of the chart. PaletteName: Gets or sets the name of the predefined Palette that will be applied to the chart. SelectionPalette: Gets or sets the ChartPalette instance that defines the appearance of the chart for selected series and/or data points. SelectionPaletteName: Gets or sets the name of the predefined SelectionPalette that will be applied to the chart. PieSeries: The PieSeries are used to visualize a single series of data in a pie chart. The sweep of a pie's slices is directly proportional to the magnitude of the data points' values. SDK Browser application contains various examples with RadPieChart control.